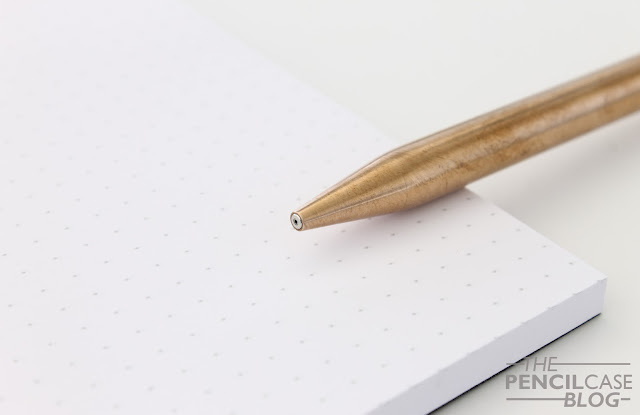 What do you get when you completely over-engineer a standard boring BIC Matic mechanical pencil, and make it into a sleek, minimalist metal design piece? That's the first question that came to mind when I first saw the Modern Fuel Mechanical Pencil version 2.0 (now on Kickstarter)! 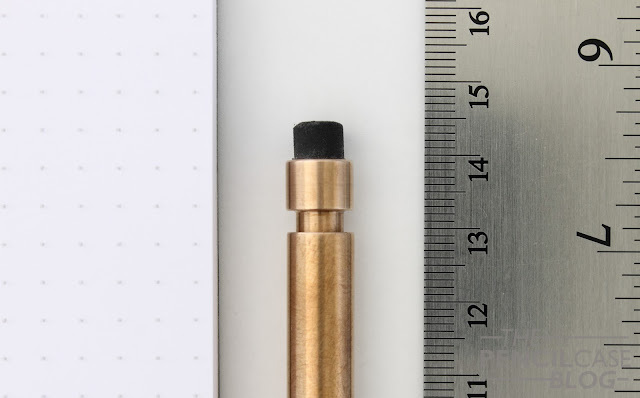 You might wonder why and how you'd possibly over-engineer a pencil that's based on a cheap disposable plastic pencil? 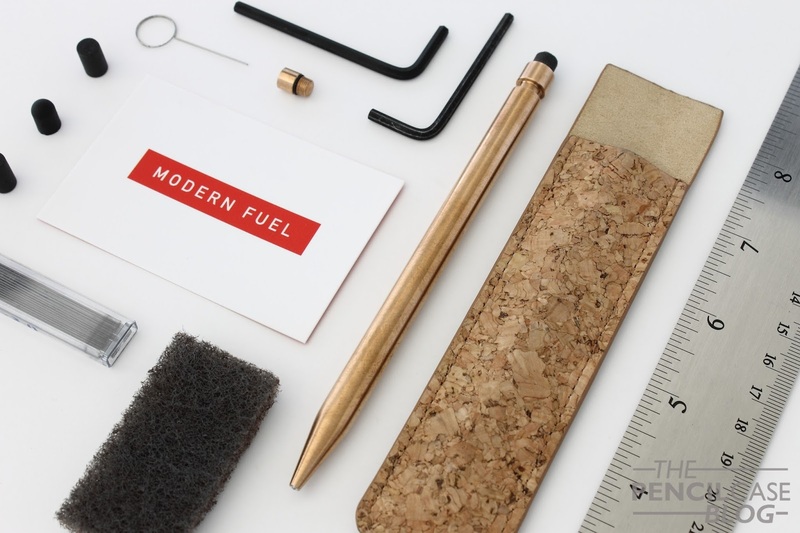 Well, Andrew from Modern Fuel proved that it's possible indeed, and he did so in a most impressive way: enter the Modern Fuel Mechanical Pencil 2.0! This isn't Andrew's first rodeo with his mechanical pencil -as the '2.0' suggests. It's an improved version of the design he launched a couple years ago on Kickstarter. Once more he aims to create a heirloom quality product with a combination of great aesthetic and quite clever engineering. Let's dive right in! 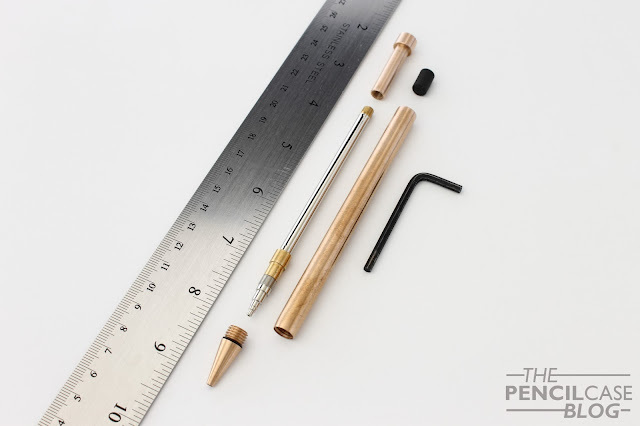 Designwise, I've always found this a fascinating pencil. Of course the strong aesthetic resemblance to the classic Bic Matic disposable mechanical pencils has a lot to do with that sentiment. 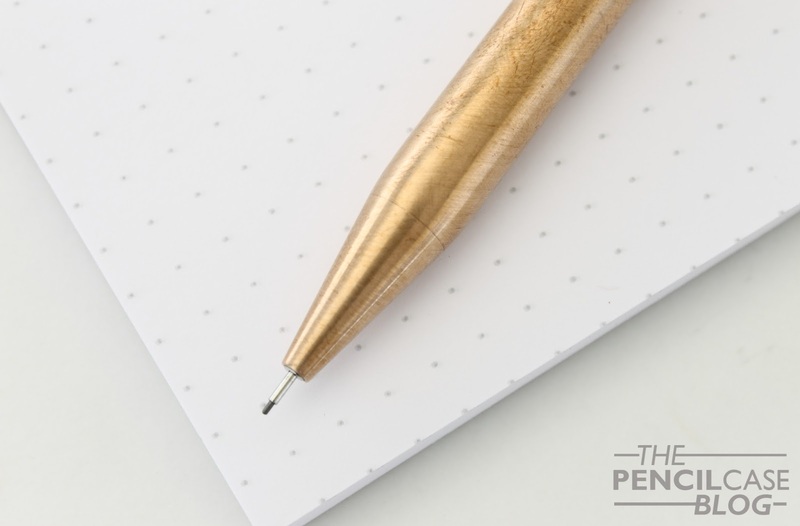 The Mechanical Pencil, just like its' predecessor, has a slender design with gently rounded and tapered shape towards the tip. The recogniseable knock mechanism with exposed eraser on top defines the entire design. Ok, I guess they probably don't like me constantly comparing this to a cheapo disposable BIC pencil. I just can't help see the resemblance between the two. To make things very clear: apart from an aesthetic resemblance, the two are in no way comparable, believe me! 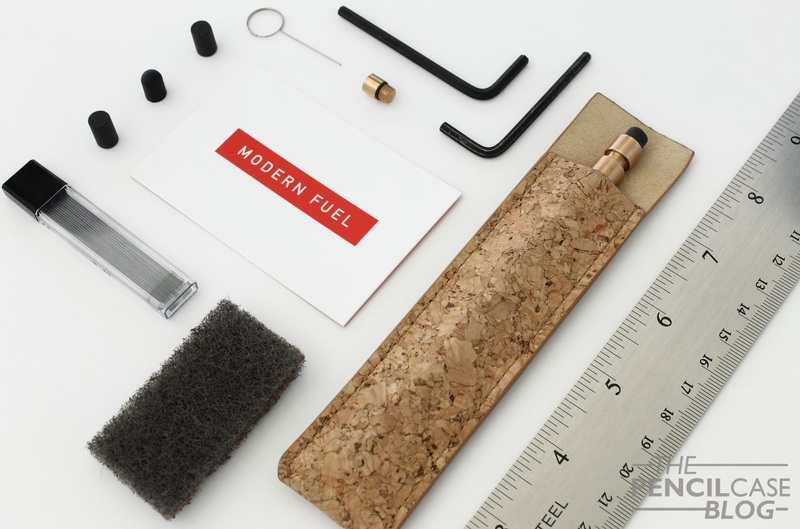 Maybe look at the Modern Fuel Mechanical Pencil as a BIC Matic on serious steroids, CNC'd from solid metal, and built to last. For version 2, Andrew stepped away from aluminium and brass, and branched out into a couple new metals to make things a bit more exciting. You now have the choice of four metals: titanium, bronze, copper or stainless steel. Bronze appealed to me most, as it's quite an uncommon metal in the pen world . It's a copper alloy just like brass, but it has a more reddish color. Which metal you choose obviously has a huge influence on the feel and balance of the pencil, but more on that later. A brushed finish is applied by hand on each pencil. I quite like that hand-finished aspect about it, it shows that the maker really puts care and time in his product. The brushed finish also does an excellent job at hiding the seam between the nose cone and barrel, which is almost impossible to see at first sight. But then on the flipside, it doesn't exactly do much in terms of comfort, unfortunately. It can definitely get a bit slippery at times, with the straight cylindrical barrel and smooth finish, which is something to keep in mind when making a purchase decision. 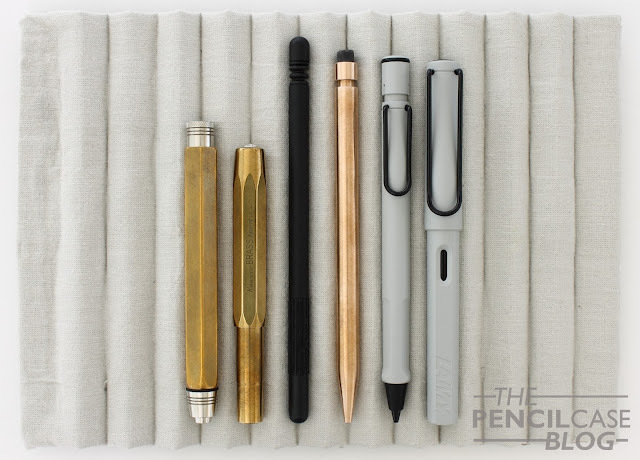 L to R: David Hayward Hexagonal, Kaweco Brass sport, Parafernalia Linea 2mm leadholder, Modern Fuel Mechanical Pencil 2.0, Lamy Safari mechanical pencil, Lamy Safari fountain pen. 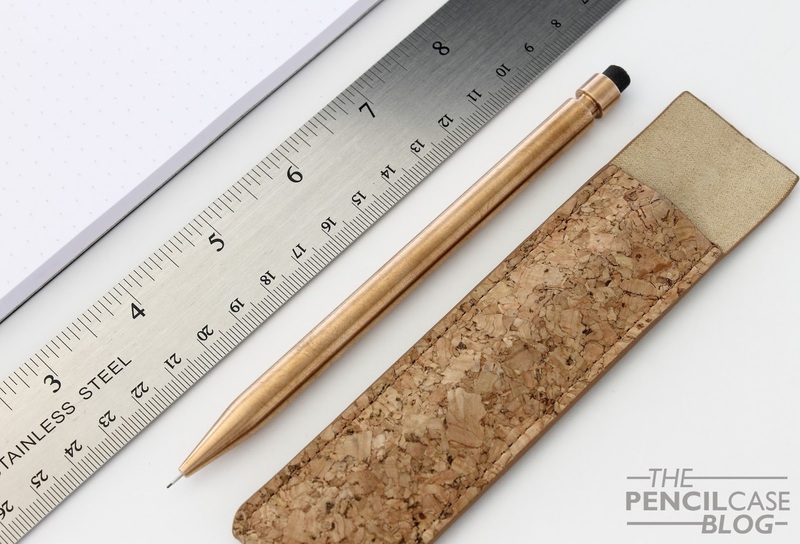 In terms of size, the Mechanical Pencil is relatively large and slender, a design that seems to work well in general with (mechanical) pencils. It measures 14.5 cm (5.7"), and 0.95 cm (0.375") in diameter. As mentioned earlier, the choice of metal sets them apart in terms of weight. Titanium is lightest, at 27g, followed by stainless steel (42g), bronze and copper both being the heaviest at 47g. I personally tested the bronze version. 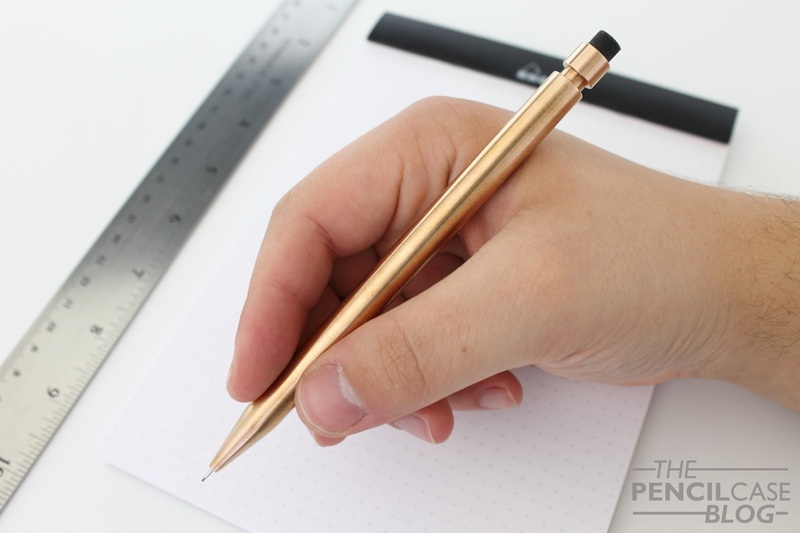 The heft is surprising for such a slim pencil, but I didn't find it too heavy in use. Perhaps the most important aspect here is the build quality. This is really the strong suit of the Mechanical Pencil 2.0. The entirely metal build feels rock-solid, especially in this heavier bronze metal, and everything fits together with tight tolerances. There's the tiniest bit of play between the barrel and mechanism knock, which may cause some rattling at times. But it's subtle, but definitely not a deal breaker. The mechanism is where version 2.0 gets the biggest upgrade over the previous itteration, with an all-metal custom removable mechanism (available in 0.5, 0.7 and 0.9mm lead thicknesses). The new mechanism also meant a complete redesign of the pencil's interior, so dissasembly of the pencil is now a bit different... and not so straightforward! When I say over-engineered, I'm not kidding: this thing is HARD to dissasemble. The eraser can be pulled out, after which you can unscrew the push button ("knock") using the included hex wrench. This step is where I failed a couple times, as you have to unscrew the knock while keeping the wrench and rest of the pencil steady. The front tip of the pencil unscrews next, which is kept in place with a rubber o-ring. After that, the mechanism can be removed from the barrel. Being able to dissasemble completely makes it easy to service the mechanism or replace broken parts (IF something breaks, but I doubt that'll ever happen). Aside from the practical aspect, I also just really like the technical complexity of this product, but hey I'm a nerd! The mechanism, as I said, can be had in 0.5, 07 and 0.9mm versions, and can be purchased separately. Mine came loaded with the 0.5mm version. For mechanical pencils, I prefer a smaller lead size like this, as I like the fine line it produces. The mechanism works smoothly, and the knock is relatively silent. The sleeve is retractable, perfect for those that want to pocket carry their pencil (a detachable clip is included with every pencil, so you can clip it to your shirt or pants pocket). The included HB leads are very smooth, even though they seem to be of no particular brand. The marks are legible, not overly dark but well-balanced. 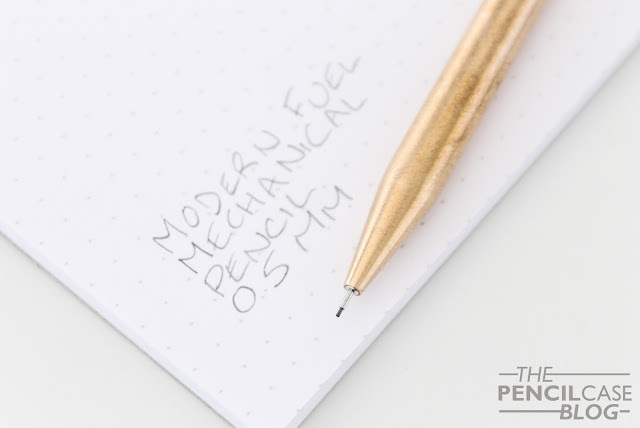 A pencil as precision machined and designed with such meticulous care as the Modern Fuel Mechanical Pencil 2.0 is not something you come across every day. Admittedly, it might be a bit overkill, but it's really cool nevertheless! 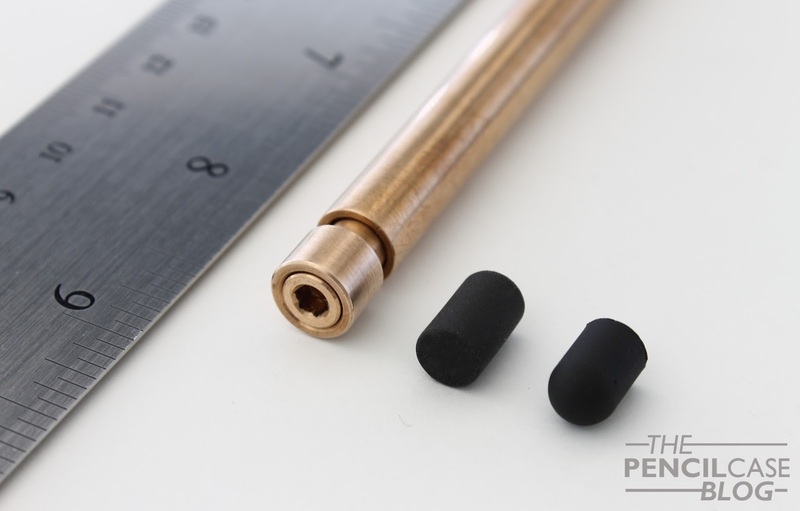 The Modern Fuel Mechanical Pencil retails for 120 USD (for copper, bronze or steel metal options), or a sloppy 300 USD for the all-titanium version. But as of the moment of posting this, you still have a little under three weeks to snag one up during the kickstarter campaign for a more manageable 80 USD (or 130 USD for the titanium). To be honest, the price tag is a bit of a stumbling block. Having had the opportunity to play with this prototype partially made me reconsider my initial impression, but I still think it's slightly too expensive. The end result is quite stunning though, and you definitely get quality product for what you pay. If they could press the cost to keep the MSRP at that Kickstarter level, I think it would be more manageable for a larger audience. As for now, it's definitely not the ultimate pencil for everyone, but for those that can appreciate a clean design and on point engineering, this could be it! Note: This product was provided on loan by Modern Fuel, free of charge, so I could write this review. I was in no way influenced in the making of this review, the opinions shared in this review are completely my own! This post does not contain affilate links. You stated "You now have the choice of four metals: titanium, bronze, copper or titanium" above but, you should have said "titanium, bronze, copper or stainless steel". Thank you for this post I have ordered the pen on kickstarter. Whoops, that's right! I'll change it. Thanks for letting me know Tim, and thanks for reading!